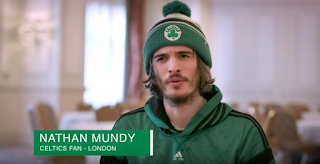 Regular readers of CelticsLife know that the reach of the Boston Celtics is worldwide, with commenters hailing from all parts of the globe to talk about their favorite team. Our writers are global as well, hailing from Mexico (myself), the United Kingdom (Josh Coyne), Poland (Tomasz Kordylewski) to name a few nations you can find members of our staff hailing from outside the US. So, it's no surprise there's fans across the pond like Nathan Mundy, highlighted by the Celtics in the video below. Where do you read CelticsLife from? Represent in the comment section below - stateside or abroad, we're all fans of the Boston Celtics.